^ Accident description at the ASN. Aviation Safety Network. 2008-03-11 [2010-07-16]. ^ NTSB. Washington D.C. 20594 – Aircraft Accident Report: USAir Flight 405 (PDF): 86. March 1993 [2010-07-15]. ^ NTSB. Washington D.C. 20594 – Aircraft Accident Report: USAir Flight 405 (PDF): 84. March 1993 [2010-07-15]. ^ 4.0 4.1 4.2 4.3 4.4 4.5 Kleinfield, N. R. The Ordinary Turned to Instant Horror for All Aboard USAir's Flight 405. The New York Times. 2010-03-29 [2010-07-15]. ^ NTSB. Washington D.C. 20594 – Aircraft Accident Report: USAir Flight 405 (PDF): 85. March 1993 [2010-07-15]. ^ NTSB. Washington D.C. 20594 – Aircraft Accident Report: USAir Flight 405 (PDF): 1. March 1993 [2010-07-15]. ^ 7.0 7.1 7.2 7.3 7.4 7.5 7.6 7.7 7.8 NTSB. Washington D.C. 20594 – Aircraft Accident Report: USAir Flight 405 (PDF): 2. March 1993 [2010-07-15]. ^ 8.0 8.1 8.2 8.3 8.4 8.5 8.6 8.7 NTSB. Washington D.C. 20594 – Aircraft Accident Report: USAir Flight 405 (PDF): 3. March 1993 [2010-07-15]. ^ Lorch, Donatella. Before Crash, USAir Pilot Spoke Uneasily of Removing Ice From Wings. The New York Times. 1992-06-23 [2010-07-17]. ^ NTSB. Washington D.C. 20594 – Aircraft Accident Report: USAir Flight 405 (PDF): 55. March 1993 [2010-07-15]. ^ NTSB. Washington D.C. 20594 – Aircraft Accident Report: USAir Flight 405 (PDF): 12. March 1993 [2010-07-15]. ^ NTSB. Washington D.C. 20594 – Aircraft Accident Report: USAir Flight 405 (PDF): 13. March 1993 [2010-07-15]. ^ 13.0 13.1 NTSB. Washington D.C. 20594 – Aircraft Accident Report: USAir Flight 405 (PDF): 47. March 1993 [2010-07-15]. ^ Philips, Don. Copilot of Fatal La Guardia USAir Flight Says He Saw No Ice at Takeoff. The Washington Post. 1992-03-26 [2010-07-17]. （原始内容存档于2012-11-04）. ^ NTSB. Washington D.C. 20594 – Aircraft Accident Report: USAir Flight 405 (PDF): 92. March 1993 [2010-07-15]. ^ NTSB. Washington D.C. 20594 – Aircraft Accident Report: USAir Flight 405 (PDF): 98. March 1993 [2010-07-15]. ^ 17.0 17.1 17.2 17.3 NTSB. Washington D.C. 20594 – Aircraft Accident Report: USAir Flight 405 (PDF): 4. March 1993 [2010-07-15]. ^ 18.0 18.1 18.2 18.3 18.4 NTSB. Washington D.C. 20594 – Aircraft Accident Report: USAir Flight 405 (PDF): 6. March 1993 [2010-07-15]. ^ Malnic, Eric; Goldman, John. Jet Crash Kills 20 in N.Y. Snowstorm : Disaster: The USAir commuter jet skids into Flushing Bay after trying to take off at La Guardia with 47 passengers, 4 crew members. Dozens are hurt.. Los Angeles Times. 1992-03-23 [2010-07-17]. ^ NTSB. Washington D.C. 20594 – Aircraft Accident Report: USAir Flight 405 (PDF): 22. March 1993 [2010-07-15]. ^ 21.0 21.1 NTSB. Washington D.C. 20594 – Aircraft Accident Report: USAir Flight 405 (PDF): 29. March 1993 [2010-07-15]. ^ Malnic, Eric. Drowning Claimed 18 Jet Crash Victims : Aviation: Many survived impact, but were strapped upside down in seats below water line as tide rose in Flushing Bay. Los Angeles Times. 1992-03-25 [2010-07-17]. ^ The Queens Spin – Plane Crashes. Queenstribune.com. [2010-07-17]. （原始内容存档于2011年6月15日）. ^ 24.0 24.1 NTSB. Washington D.C. 20594 – Aircraft Accident Report: USAir Flight 405 (PDF): 33. March 1993 [2010-07-15]. ^ 26.0 26.1 NTSB. Washington D.C. 20594 – Aircraft Accident Report: USAir Flight 405 (PDF): 34. March 1993 [2010-07-15]. ^ Barron, James. At Least 19 Killed in Crash at Snowy La Guardia. The New York Times. 1992-03-23 [2010-07-17]. ^ Mitchell, Alison. 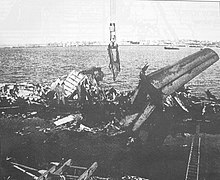 CRASH AT LA GUARDIA; The Tides of Flushing Bay Dictated the Pace of Rescue Efforts. The New York Times. 1992-03-24 [2010-07-17]. ^ NTSB. Washington D.C. 20594 – Aircraft Accident Report: USAir Flight 405 (PDF): 72. March 1993 [2010-07-15]. ^ 30.0 30.1 NTSB. Washington D.C. 20594 – Aircraft Accident Report: USAir Flight 405 (PDF): 73. March 1993 [2010-07-15]. ^ 31.0 31.1 NTSB. Washington D.C. 20594 – Aircraft Accident Report: USAir Flight 405 (PDF): 76. March 1993 [2010-07-15]. ^ NTSB. Washington D.C. 20594 – Aircraft Accident Report: USAir Flight 405 (PDF): 83. March 1993 [2010-07-15]. ^ 33.0 33.1 National Transportation Safety Board. Washington D.C. 20594 – Aircraft Accident Report: USAir Flight 405 (PDF): 77. March 1993 [2010-07-15]. ^ NTSB. Washington D.C. 20594 – Aircraft Accident Report: USAir Flight 405 (PDF): 81. March 1993 [2010-07-15]. ^ 35.0 35.1 35.2 NTSB. Washington D.C. 20594 – Aircraft Accident Report: USAir Flight 405 (PDF): 53. March 1993 [2010-07-15]. ^ NTSB. Washington D.C. 20594 – Aircraft Accident Report: USAir Flight 405 (PDF): 36. March 1993 [2010-07-15]. ^ NTSB. Washington D.C. 20594 – Aircraft Accident Report: USAir Flight 405 (PDF): 75. March 1993 [2010-07-15]. ^ NTSB. Washington D.C. 20594 – Aircraft Accident Report: USAir Flight 405 (PDF): 49. March 1993 [2010-07-15]. ^ NTSB. Washington D.C. 20594 – Aircraft Accident Report: USAir Flight 405 (PDF): 50. March 1993 [2010-07-15]. ^ NTSB. Washington D.C. 20594 – Aircraft Accident Report: USAir Flight 405 (PDF): 42. March 1993 [2010-07-15]. ^ NTSB. Washington D.C. 20594 – Aircraft Accident Report: USAir Flight 405 (PDF): 54. March 1993 [2010-07-15]. ^ NTSB. Washington D.C. 20594 – Aircraft Accident Report: USAir Flight 405 (PDF): 26. March 1993 [2010-07-15]. ^ NTSB. Washington D.C. 20594 – Aircraft Accident Report: USAir Flight 405 (PDF): 40. March 1993 [2010-07-15]. ^ NTSB. Washington D.C. 20594 – Aircraft Accident Report: USAir Flight 405 (PDF): 41. March 1993 [2010-07-15]. ^ 46.0 46.1 NTSB. Washington D.C. 20594 – Aircraft Accident Report: USAir Flight 405 (PDF): 56. March 1993 [2010-07-15]. ^ NTSB. Washington D.C. 20594 – Aircraft Accident Report: USAir Flight 405 (PDF): 65. March 1993 [2010-07-15]. ^ NTSB. Washington D.C. 20594 – Aircraft Accident Report: USAir Flight 405 (PDF): 64. March 1993 [2010-07-15]. ^ NTSB. Washington D.C. 20594 – Aircraft Accident Report: USAir Flight 405 (PDF): 70. March 1993 [2010-07-15]. ^ NTSB. Washington D.C. 20594 – Aircraft Accident Report: USAir Flight 405 (PDF): 78. March 1993 [2010-07-15]. ^ 51.0 51.1 51.2 NTSB. Washington D.C. 20594 – Aircraft Accident Report: USAir Flight 405 (PDF): 79. March 1993 [2010-07-15]. ^ 52.0 52.1 NTSB. Washington D.C. 20594 – Aircraft Accident Report: USAir Flight 405 (PDF): 80. March 1993 [2010-07-15]. ^ Farnsworth, Clyde H. Canadian Judge Calls Air Crash Avoidable. The New York Times. 1992-03-27 [2010-07-17]. ^ NTSB. Washington D.C. 20594 – Aircraft Accident Report: USAir Flight 405 (PDF): 61. March 1993 [2010-07-15]. ^ NTSB. Washington D.C. 20594 – Aircraft Accident Report: USAir Flight 405 (PDF): 62. March 1993 [2010-07-15]. ^ Report of the FAA International Conference on Airplane Ground Deicing Held in Reston, Virginia on May 28–29, 1992 – Storming Media. Stormingmedia.us. 1992-03-22 [2010-07-17]. ^ NTSB. Washington D.C. 20594 – Aircraft Accident Report: USAir Flight 405 (PDF): 44. March 1993 [2010-07-15]. ^ A. Stefl, Barbara; F. George, Kathleen. Abstract : Antifreezes and Deicing Fluids : KirkOthmer Encyclopedia of Chemical Technology : Wiley InterScience. KirkOthmer Encyclopedia of Chemical Technology. 2000-12-04 [2010-07-16]. ^ Brady, Chris. The Boeing 737 Technical Guide. 2010. ^ White, Jim. Infrared Aircraft De-Icing. Airporttech.tc.faa.gov. 2009-05-18 [2010-07-15]. （原始内容存档于2010年5月27日）. ^ McCormick, Carroll. Infrared Deicing: Giving glycol a run for its money. Wings Magazine. [2010-07-15]. ^ Winter service team at Dresden Airport ready for the cold season. Dresden Airport. 2004-10-29 [2010-07-15]. （原始内容存档于2009-02-06）.